With nearly 80% of crops worldwide requiring pollination, there's a great need for bees and other pollinating creatures. 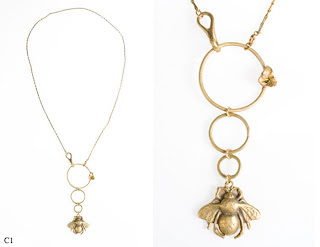 So Alkemie, eco-friendly jewelry designers, are donating 100% of the profits from this necklace to the Pollinator Partnership, a non-profit group researching Colony Collapse Disorder. All of Alkemie's jewelry is made in California from reclaimed metals. Get one of these bee-uties for you or someone you love at eConscious Market. 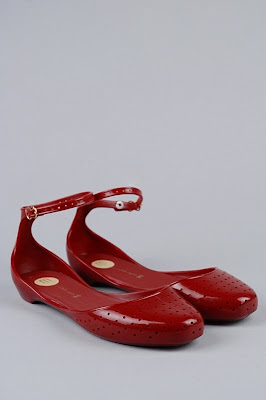 I am so pining for these adorable ankle strap flats by Melissa. They're plastic, but a plastic that's both recycled and recyclable. Based in Australia with manufacturing in Brazil, sustainability and fair employment are at the core of Melissa's ethic -- despite its multinational presence. The shoes are made with close to zero waste, with the utmost care taken to reduce use of resources like water and energy. How could I not love a pair of shoes like that?